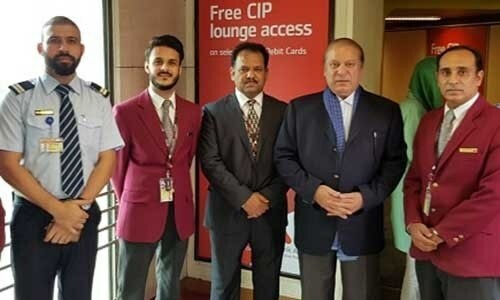 LAHORE: Former prime minister Nawaz Sharif and his daughter Maryam Nawaz have deferred their return to Pakistan because of the “critical condition” of Begum Kulsoom Nawaz who has been on a ventilator in a London hospital since she suffered a cardiac arrest last week. A counsel for the Sharif family will file an application on Tuesday (today) for exemption of Mr Sharif and Ms Maryam from personal appearance in the corruption references against them in the accountability court, Islamabad. “Since the condition of Begum Kulsoom Nawaz is very critical it is simply out of the question that Mr Sharif and Ms Maryam can leave her at this moment. They will return once her condition improves,” PML-N spokesperson Marriyum Aurangzeb told Dawn on Monday. She said a counsel for the Sharif family would file for their (Nawaz’s and Mar­yam’s) exemption from personal appearance in the accountability court on Tuesday and hopefully the court would grant the request. Both the father and the daughter were to appear before the court in the Avenfield properties reference. They had reached London on Thursday with a promise to return after Eid to appear in court. The court on Thursday gave the Nawaz Sharif family’s lawyer a last chance to begin final arguments in the Avenfield reference after the Eid holidays. “I had till July 10 to conclude the trial in three references, therefore the defence counsel gets one last chance to begin its arguments,” accountability court judge Mohammad Bashir observed. Barrister Jahangir Jadoon may file a fresh exemption application explaining about ‘genuine reason’ of Mr Sharif and Maryam Nawaz regarding their skipping the court appearance. On Sunday, Nawaz Sharif, Shahbaz Sharif, Maryam Nawaz, Hussain Nawaz and Suleman Shahbaz held a meeting with a panel of doctors who briefed them about the patient’s condition. “Shifting Begum Kulsoom from the ventilator will be decided by the panel of doctors,” a PML-N leader said. Talking to reporters outside Harley Street Clinic, Nawaz Sharif said his wife’s condition was critical and doctors had kept her on life support. “She is still in intensive care and sedated. She needs prayers,” he said. PML-N president Shahbaz Sharif, who visited his sister-in-law, said Begum Kulsoom was being given best treatment urging the people to pray for her fast recovery. Begum Kulsoom was shifted to hospital after she suffered a sudden cardiac arrest last Thursday. Nawaz and Maryam were on the flight to London at that time. In August, Begum Kulsoom was diagnosed with lymphoma (throat) cancer. She had undergone a surgery, and several sessions of chemotherapy and radiotherapy. Initially, she responded to the treatment well but of late her condition has deteriorated. On Saturday, a man tried to enter Begum Kulsoom’s hospital room allegedly without permission sparking alarm among the Sharif family. 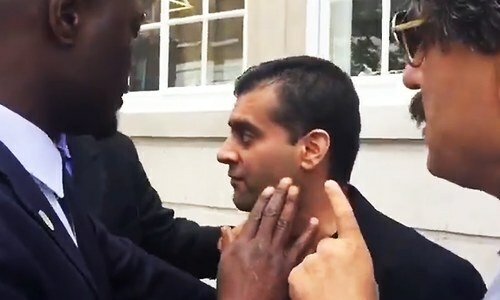 In a video shared on Twitter, the man identified himself as Navid. Talking to DawnNews TV, he said he was a doctor with a medical practitioner’s ID card. He had allegedly been spotted in the vicinity of the clinic at 9am and went in around 10am when it opened. Hussain Nawaz said he had immediately alerted security, who then called the police. Police briefly detained Navid and let him go after his medical practitioner’s ID card was scrutinised and they (police) did not find him guilty of a criminal offence. Navid said he wanted to inquire after Begum Kulsoom. “I had gone to see her and I had done nothing wrong,” he said. To a question about this political affiliation, Navid said he was a former member of the Pakistan Tehreek-i-Insaf but he was there to support the Sharif family. I have no sympathies for NAwaz Sharif as he never had for the poor public. He looted Pakistan instead of building hospitals. His family is under treatment in England but what about us millions in Pakistan? He must appear for his court dates. They will not come back to hear the verdict Of the NAB trial as it will declare Maryam ineligible or contest elections. 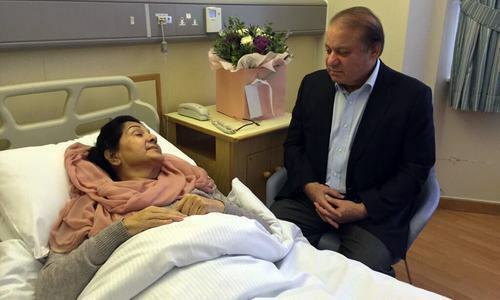 The shareef family is playing delay tactics on kulsoom's illness. The SC should request the foreign office to summon the British High Commissioner and get the real truth behind kulsoom ventilator drama from their Foreign Commonwealth Office.